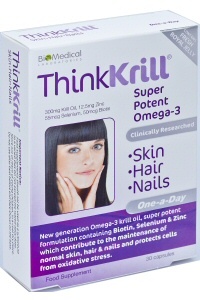 This super potent Omega-3 Krill Oil supplement has been specially formulated to include the following essential nutrients Selenium, Biotin and Zinc required to maintain healthy ThinkKrill – Skin • Hair • Nails. We have also added 30 mg of Fresh Royal Jelly, a nutrient packed substance which helps provide hydration and aids regeneration of the cells. The benefits of Omega-3 fatty acids are needed by every cell in the body and when they are present in enough quantity they can help keep you looking and feeling great. Getting enough Omega-3 is essential to optimise health and bring out the natural beauty in your skin hair and nails. Omega-3 fatty acids cannot be produced by the body and therefore must be obtained from alternative sources such as foods or supplementation. Krill Oil is proven to be more bio available than fish oil as Krill Oil is in a phospholipid format which the body can easily absorb. Fish oil is a triglyceride and the body has to break this down into a phospholipid format before it can be absorbed. The Krill oil used in ThinkKrill Skin Hair Nails is sourced from the Antarctic where the waters are clean and therefore is high in purity free from heavy metals, PCB’s and toxins. Plus Krill oil contains a naturally occurring potent antioxidant called Astaxanthin, which provides protection against free radicals. Now available from independent pharmacies and health food stores and online. Brand Advert, product focus for Brain Vision Heart & Joints.